At a height of 165m, the Singapore Flyer is the world’s largest Giant Observation Wheel. It held its groundbreaking ceremony in September 2005 and was launched in 2008. It promises more than just a view, but a panorama that captures Marina Bay’s skyline with a glimpse of neighbouring Malaysia and Indonesia. Singapore Flyer, a giant observation wheel, belongs to a completely different generation from the traditional ferris wheels. Britain’s London Eye, which is 30m lower than Singapore Flyer, started the new generation of giant observation wheels. Unlike ferris wheels with their cramped carriages which hang in open air, Singapore Flyer and other giant observation wheels such as the London Eye feature fixed capsules. Also, each Singapore Flyer capsule is about the size of a bus and can carry up to 28 people. Passengers are able to walk around and enjoy the views outside without feeling any movement or vibration at all. In contrast, due to its reliance on gravity which helps in keeping its carriage balanced, the carrying capacity of the ferris wheel is usually limited to about 8 passengers. 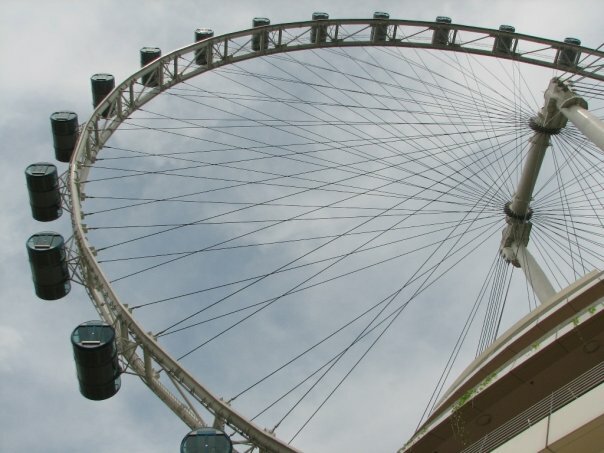 These factors, as well as others, distinguish giant observation wheels like Singapore Flyer from the older-generation ferris wheels. There is a lot more to see and do around the Flyer.